India runs on two-wheelers. It wouldn’t be wrong to say that, would it? Till today, two-wheelers dominate the Indian roads. They are affordable, easy to drive, stylish, handy in traffic jams and narrow streets, and easy to park. These benefits make two-wheelers a king on Indian roads. Your budget will depend on your attitude as a consumer and how much you can afford to spend on a two-wheeler. You need to understand your need first: Why do you need a bike? Is it a necessity? Is it the convenience it offers? Or is it a pure indulgence? Once you identify your need, the next thing to do is determine how much you are willing to spend. Most two-wheelers cost anywhere around ₹ 45,000 to ₹ 60,000. The two-wheeler industry of India is one of the largest in the world. With a long list of manufacturers vying to get the attention of buyers, you are spoilt for choice. But the choices should not confuse you, rather they should help you narrow your options. Be clear in your head of what you want. Bike or scooter? Affordable or luxury? Choose the segment which appeals to your need and budget the most. Check the vehicle’s fuel efficiency before buying it. A two-wheeler with good mileage can lower your daily commuting costs. Mileage is the average distance covered in 1 litre of fuel. The fuel efficiency of a two-wheeler differs when driven in the city and on the highways. You may not be able to measure the performance of the two-wheeler before you buy it. But reviews from users can help. Ask your friends or look for reviews online for help. Go through information on engine performance, on-road performance, fuel-efficiency, maintenance issues, etc. Also, compare the reviews of various two-wheelers, before deciding which one to buy. Regular service of your two-wheeler is important for it to deliver top performance. So, you have decided which two-wheeler to buy. Now you have to make it happen at all times. This reduces your wait period and prevents the servicing from getting expensive. 6. Are you ready to buy? Now that you have decided which two-wheeler to buy, it's time to make it happen. There are plenty of finance options available that can help you buy your two-wheeler. One of the popular finance options is a personal loan for two-wheeler from MoneyTap. Why MoneyTap’s personal loan for two-wheeler is a popular choice of finance? With an ever-shrinking road space, the city life throws many challenges at us. Two-wheelers are a better and affordable option to face these challenges. 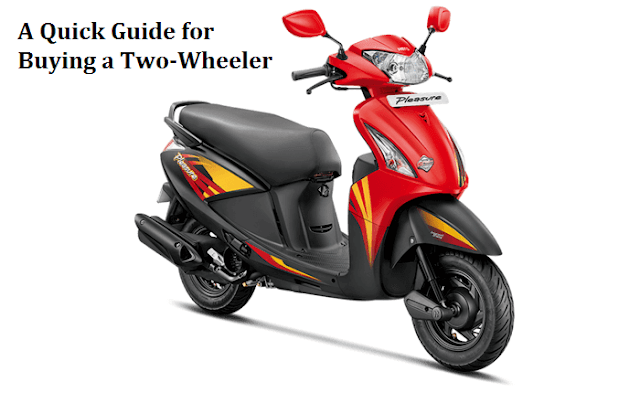 This pre-purchase quick guide will help you decide the right two-wheeler for you. yes, I am ready to buy now. Thank you for the information.